• Immunopathology of infectious, allergic and autoimmune disease. 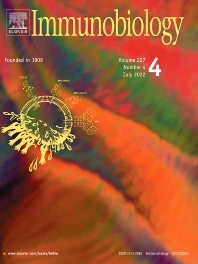 Following its history as the first ever published Specialist Immunology Journal, founded in 1909, Immunobiology follows its mission to form a vital link between scientists and clinicians by offering a fast track line for high priority publications to speed up communication amongst immunologists all over the world. In the best of sprits, Immunobiology aims to continue the tradition set by its founding members and supporters, including such distinguished scientists as Paul Ehrlich, Hans Sachs, Carl Oluf Jensen, Sibasaburo Kitasato, Karl Landsteiner, Max Neisser and many others. The journal publishes original research articles, short communications, reviews, commentaries and letters to the editors. In addition the journal publishes Special Issues to widely cover specific research themes within the field of Immunology and proceedings of Immunological Societies.